Mother’s Day is just a couple weeks away so it’s time to start thinking about ways to celebrate. What does every mom want? Chocolates, flowers, shopping sprees, an elaborate breakfast in bed? Nah, what every mom wants is a chill day and a glass of rosé, AMIRITE?? But I’ll give ya something better — Peach Melba Frosé! Every sip of this Peach Melba Frosé is full of sweet peaches and deliciously tart raspberries. It’s the perfect frosty (and boozy) treat! Best of all, it’s super easy to make with just five simple ingredients and has zero added sugar. Thanks to Vitamix and TheFeedFeed for sponsoring this post, and thank YOU for supporting the brands that keep Desserts With Benefits going! All opinions are mine and mine alone. If you’ve ever wondered how to make frosé — look no further, I’ve gotcha covered. I instantly remembered this frosé I had at a restaurant recently. It’s like a drink and dessert all in one! But most frosé recipes are pretty boring, calling for just rosé + simple syrup. They’re also time-consuming and require freezing the rosé overnight before blending it the next day . I mean, that frosé is good and all, but it’s also blah. Step it up a notch (and skip the day-ahead prep) with this fun and flavorful PEACH MELBA variation! What is Peach Melba? Traditionally, it’s vanilla ice cream that’s served alongside peaches and raspberry sauce. 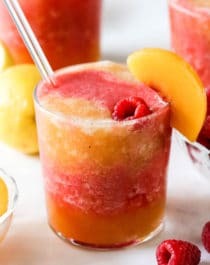 To translate that flavor into a frosé, all you need is a bottle of good rosé, frozen peaches, fresh raspberries, a lil splash of lemon juice, and some Vanilla Paste or a freshly scraped vanilla bean (and if you want to sweeten things up a bit, feel free to add in some honey or agave nectar to taste, but that’s totally optional). 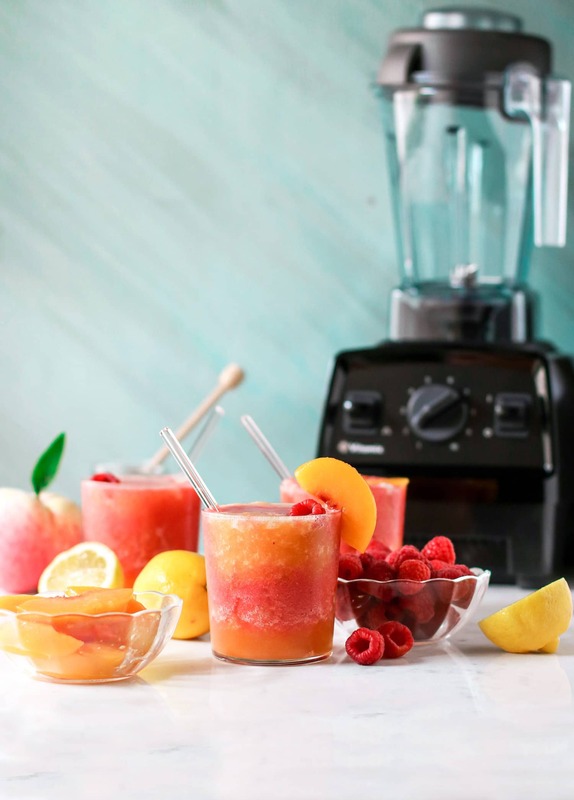 Give it all a whirl in a high-speed blender like a Vitamix and BOOM, you’re all set and ready to indulge in the most delicious frosé you’ll ever sip on! I’ve had a Vitamix for over four years now and use it on the daily. From normal blender smoothies to crazy cool things you can only make in such a high-performance, high-speed, powerful machine: creamy nut butters, smooth nut milks, finely ground homemade oat flour, green smoothies without the green chunks, even ice cream. And obviously, this Peach Melba Frosé too. The fact that my Vitamix is still going strong after four years boggles my mind. I’ve never owned another blender for longer than two. I’ll never go back to another blender, first because I love my Vitamix so much, and second, I’ll never have to. 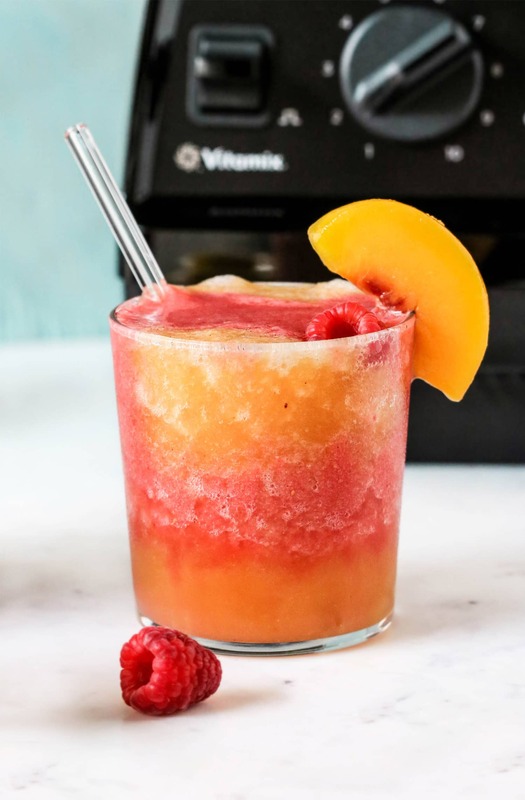 Forget about that boring frosé from brunch and make this Peach Melba Frosé instead. 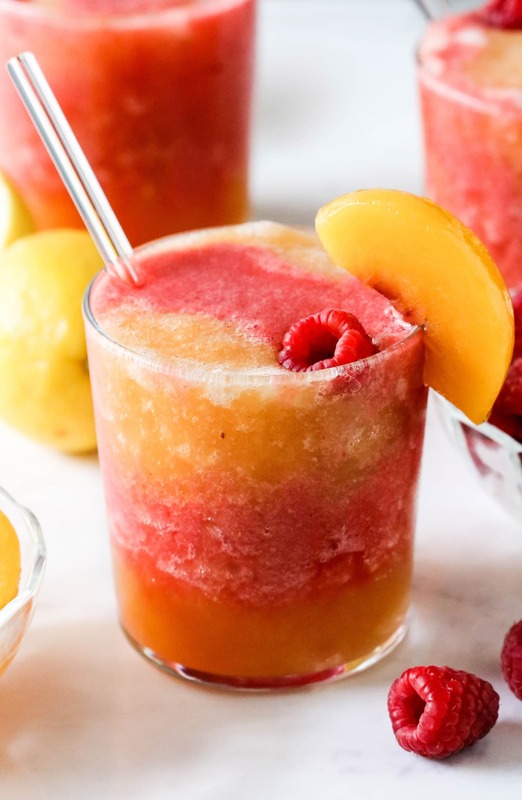 Peaches, raspberries, and good ol’ rosé come together to create this sweet, frosty delight! In a Vitamix, add the rosé, frozen peach slices, lemon juice, and vanilla paste. Puree until completely smooth. Pour 3 cups of the purée into a measuring cup and place in the freezer while you make the raspberry portion. Add the raspberries to the remaining purée in the blender. Puree until completely smooth. Pour the purée into a measuring cup and place in the freezer. Freeze both purees for 30 minutes, or until they’re like an Icee consistency, along with your glasses/serveware. Assemble the frosés. Alternate pouring the peach and raspberry frosés into the chilled glasses. Serve immediately! To serve, toss in a few fresh raspberries, add a wedge of a freshly sliced, juicy peach, and finish with a straw. You’re now ready to sip on perfection ? Feel free to substitute the Vanilla Paste with a freshly scraped vanilla bean. If your fruit isn’t very sweet (or if it’s out of season), you can blend in Raw Honey or Agave Nectar to taste. My frozen peaches were a bit bland but my raspberries were super sweet so I didn’t need to add any sweetener. I can’t wait to experiment with other flavors like strawberry-blood orange, lemon-rosewater, and pineapple-mint! Make this Mother’s Day the best Mother’s Day yet by making this Peach Melba Frosé! One sip and mom will instantly know how much you truly love, appreciate, and care about her. What could mom want more than some of this frosé?? The answer is nothing ?